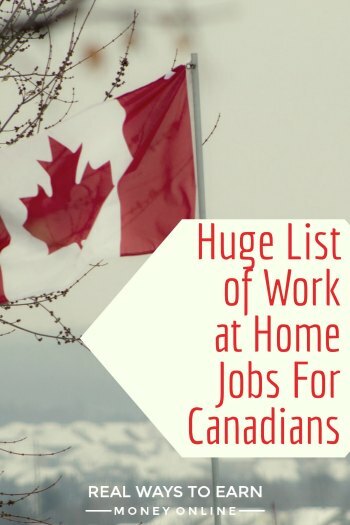 Please note that this list of work at home jobs for Canadian citizens is in the process of growing and will continue to do so as I find new things. I encourage you to let me know if you see an opportunity listed that shouldn't be here or if you know of another opportunity open to Canadians that I should add. After you have browsed these listings, be sure to scroll to the bottom of the page for more resources that may help you find work at home jobs for Canadians. Apple – very occasional openings for Canada. FlexJobs has regularly updated work from home job leads for Canadians. Note this is a pay-to-access site, but I've paid and found it to be an excellent resource considering the lack of scams, no ads, and quantity/quality of the leads. Use promo code AFFILPROMO to get 30 percent off a membership here. About.com has a good list of companies that hire Canadians for work at home. FreelanceWritingJobs.ca is a blog with regularly updated freelance writing jobs for Canadians. Thank you so very much for this list – there are so many sites on here I’d never heard of. It’s amazing to have the list – but to have a review as well is going above and beyond. Very, very much appreciated! Well, this is a wealth of information, I live in Kamloops,B.C., and I’m on disability, so working from home is a must for me. All I need is the right job and the money will roll in quickly. I’m not sure how to pick the right job as that is paramount to being happy and able to do the job right and prompt. Unfortunately that may take some time and I want to get started making some extra money for Christmas and birthdays of my grandchildren. Lets get started now, anyone got any suggestions for me to pick the right job.???? Thanks for adding Canadian Working Moms is a pay to access site. They advertise on Craigslist as having many opportunities and then when you respond send a canned response to sign up for their site. Last I checked it’s 10/month. They’re shady as heck and a disgrace to sites such as yourself who put in honest hard work. Just an FYI that Online Writing Jobs is only for U.S citizens. Thank you for such a great reference tool for Canadians! Just what I’ve been searching for. Thank you for letting me know this! I will edit accordingly. Anna, I thought KGB is only hiring from the Philippines now? I think this was a while ago that I had heard this and hadn’t heard that it changed at all. I could be wrong though. That may be true … the last time I checked their page, they only had openings there. I’ll make a note on the review. Thank you! Thank you! Thank you Anna. I am a proud Canadian and I have been looking all around for a compilation of work at home opportunities for Canadians. This is just awesome of you to help everybody like this. Glad you find it helpful! I try to add to it every time I come across a company that is definitely open to Canadians, so be sure to bookmark.